1-CD Digipak (6-plated) with 40-page booklet, 31 tracks. Playing time approx. 75 mns. Peterson’s story, along with newly discovered information, is told by entertainer/essayist Johnny Vallis in a remarkably informative booklet that boasts both a detailed discography and a generous selection of photos. Jam packed with 31 stellar recordings, many fan favorites are re-released for the first time, all with the famous Bear Family sound. More than just a hits collection; this superior package provides a fitting retrospective to an often overlooked talent. You had to hear him to understand what the big deal was. The four and a half octave range, the dramatic flair, and the naked empathy were all unique. 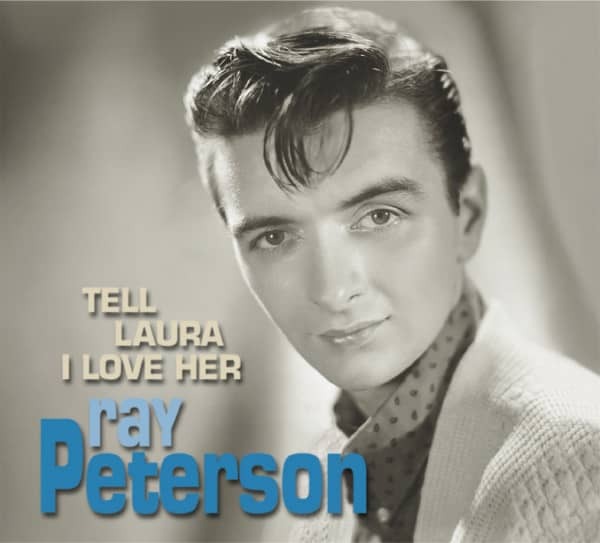 During his early '60's peak, Peterson's was the ultimate voice of teenage longing and heartbreak. 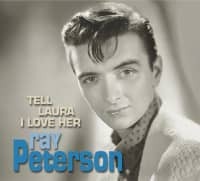 "It was a real thrill hearing 'Tell Laura I Love Her' as sung by Ray, with such heart, like it happened to him, or Tommy was his brother," marvels songwriter Jeff Barry. "Ray was an artist who sang the words - he let his innate talent take care of the notes." Born Raymond August Krah on April 23, 1935 to Herbert and Meredith Krah, he was still very young when his birth parents divorced and mother Meredith married Harvey Bernard Peterson. Adopted, he was raised as Ray Peterson in Denton, Texas where he had a younger half brother and sister, David and Meri Jane, respectively. Peterson was a normal, active child until he contracted polio at age 14. "The doctors told him that he would never walk again without braces or crutches,” recalls Peterson's third wife, Claudia. "You tell Ray Peterson something like that, and he was out to prove you wrong.” However, the change in the youngster's lifestyle was drastic. ”He was a sports guy before he contracted polio. He wasn't even thinking about singing. He thought it was for sissies.” During his lengthy course of treatment, a chance opportunity changed his mind. "There he was in the Warm Springs Foundation and the sports life was pretty much ended and ended up singing 'White Christmas' over the radio,” explains Claudia. "They got a lot of calls on that. So he started singing in the wheelchair.” Entertaining fellow patients helped him discover his joy of performing. Peterson left Warm Springs with arm and leg-braces and a slight limp that he'd have for the rest of his life. Invited to perform on a Telethon for polio, the 19-year-old made the arduous car-trip to Los Angeles. In a bittersweet quirk of fate, just as the budding singer arrived, the vaccine was successfully introduced, saving millions from the sort of heartbreak he had already experienced. Initially living in his car, Peterson was determined to stay in Los Angeles and make it as a professional singer. To support himself, he worked at IBM during the day and entered singing contests in local clubs at night. At one such club, the singer met Stanley Shulman who, in short order, became his manager and eventual business partner. A man with connections, Shulman set up meetings to get Peterson a recording contract. 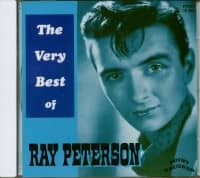 The skinny young singer impressed RCA, who signed him in the fall of 1957. At his first session at Radio Recorders, Studio B on October 14, 1957, he recorded a version of Fever. Previously recorded by Little Willie John, the song and its flipside We're Old Enough To Cry, showed off his unique vocal attributes. At this session they also recorded Doggone It, which was first unearthed by Bear Family in 1987 [Bear Family LP BFX 15245]. Although he eventually sang Fever on Ed Sullivan's CBS variety program, 'The Toast Of The Town,' his version didn't chart. It would be Peggy Lee who would enjoy a #8 pop hit with the song. Still looking for a breakthrough hit, Peterson recorded three songs written by Jo Ann Belvin at the January 20, 1958 session. Jo Ann had co-written husband Jesse Belvin's hit Guess Who. According to Peterson, Belvin's tender emotional technique had a major impact on his own emerging style. "I have been influenced by many people when it comes to my music," Peterson told writer Gary Sorkin. "If I could choose who had the greatest influence, I'd say Jesse Belvin." In later years, Peterson claimed he was godfather to Belvin's second son. Both Belvins wrote Let's Try Romance for Peterson. Flying solo, Mrs. Belvin penned Suddenly, which was backed with Jack Marshall's tune Tail Light. Then Shirley Purly being the B-side to Let's Try Romance. (A version of Shirley Purly by Jimmie Maddin on Imperial label was released in 1958 as well.) Two more sessions followed in June of 1958 resulting in Dream Away backed with I'll Always Want You Near, both recorded and produced by Lee Shapiro. The follow-up single Patricia was produced by Herman Diaz Jr. on June 30th, the flip, My Blue Eyed Baby was recorded at a session a few days earlier. Despite all this studio activity, Peterson didn't score with anything remotely resembling a hit until he recorded the romantic ballad The Wonder Of You. Baker Knight wrote the song with Peterson's label mate Perry Como in mind. Knight had met Peterson and offered him the song. Backed by the Shorty Rogers Orchestra, the tune was just what Peterson needed. Starting May 18, 1959, the recording spent 16 weeks on the pop chart, peaking at #25. Overseas, Peterson's version (#23, UK) was slightly overshadowed by established British hitmaker Ronnie Hilton's cover (#22, UK). However, modern audiences know the song best by Elvis Presley. During the peak of his comeback, the King of Rock 'n' Roll recorded a melodramatic live version in Las Vegas that became a #9 pop and #1 Adult Contemporary hit in 1970. Customer evaluation for "Tell Laura I Love Her"